Unofficial results show that Republican former U.S. Rep. Ron DeSantis led Gillum the Tallahassee mayor, by less than 0.5 percentage points. In the Senate race, Republican Gov. Rick Scott’s lead over Democratic incumbent Bill Nelson is less than 0.25 percentage points. The recount of Florida’s razor-thin Senate and gubernatorial races is off to a bumpy start with some mishaps and litigation, bringing back memories of the 2000 presidential fiasco. The lawsuit says Snipes has failed to account for the number of ballots left to be counted and failed to report results regularly as required by law. The county is emerging as the epicenter of controversy in the recount. The Florida secretary of state ordered the recounts to be completed by Thursday in all 67 Florida counties. Unofficial results in the governor’s race show Republican former U.S. Rep. Ron DeSantis led Democratic Tallahassee Mayor Andrew Gillum by less than 0.5 percentage points. In the Senate race, Scott’s lead over Democratic incumbent Bill Nelson is less than 0.25 percentage points. Delays and some mishaps have marked the start of the recount in Florida’s razor-thin Senate and gubernatorial races. The start of the recount in Florida’s Democratic-leaning Broward County was delayed Sunday because of a problem with one of the tabulation machines. 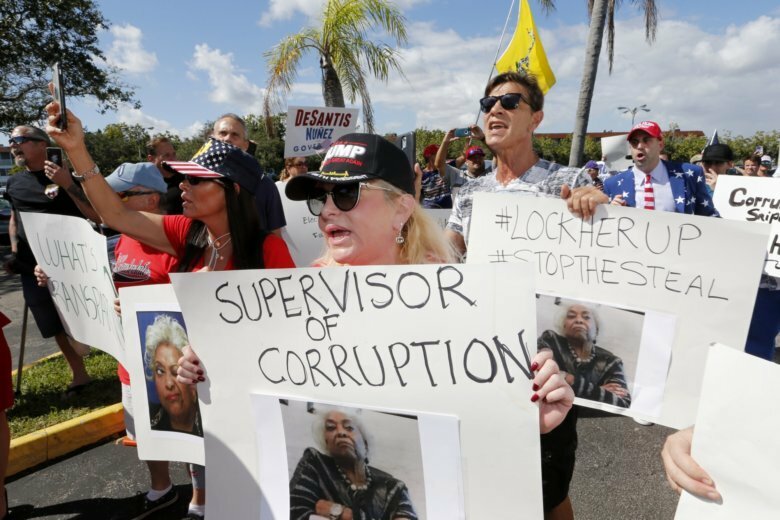 The Republican Party attacked Broward’s supervisor of elections, Brenda Snipes, of “incompetence and gross mismanagement” following the delay, which was resolved within two hours. The county, the state’s second-most populous, is emerging as the epicenter of controversy in the recount. Broward officials said they mistakenly counted 22 absentee ballots that had been rejected, mostly because the signature on the return envelope did not match the one on file. It is a problem that appears impossible to fix because the ballots were mixed in with 205 legal ballots. Snipes said it would be unfair to throw out all the ballots. The recounting of Senate and gubernatorial ballots is underway in Florida’s second most-populous county after it fixed problems with its machines. Broward County began counting about 700,000 ballots Sunday after a more than two-hour delay caused by a tested machine that wasn’t registering all ballots. Republican representatives asked that all machines be retested and county officials agreed. The heavily Democratic county is one of two where Republicans have made allegations of possible ballot fraud. State elections and law enforcement officials say they have seen no evidence suggesting the allegations are true. The Florida secretary of state ordered the recounts Saturday. The count must be completed by Thursday. Unofficial results show that Republican former U.S. Rep. Ron DeSantis led Democratic Tallahassee Mayor Andrew Gillum by less than 0.5 percentage points. In the Senate race, Republican Gov. Rick Scott’s lead over Democratic incumbent Bill Nelson is less than 0.25 percentage points. The recounting of Senate and gubernatorial ballots has been delayed in Florida’s second most-populous county because of problems with the machines. Broward County is scheduled to begin counting about 700,000 ballots Sunday morning, but a tested machine wasn’t registering all ballots. Republican representatives asked that all machines be retested and county officials agreed. Elections workers are beginning to recount ballots in Florida’s U.S. Senate and governor races under a state-ordered review of the two nationally watched races. Miami-Dade County election officials began feeding ballots into scanning machines Saturday evening, among the first in Florida’s 67 counties tasked with a Nov. 15 deadline to submit vote counts to the state. The Florida secretary of state ordered the recounts Saturday.